In 1823, a red boar, whose parents were probably taken from England, was obtained by Isaac Frink of Milton in Saratoga, New York. Frink had obtained the boar from a man named Harry Kelsey. Kelsey owned a famous trotting stallion, named Duroc, and Frink named his red boar in honor of that horse. That boars progeny continued the Duroc pig name and many of his offspring inherited his color, quick growth and maturity, deep body, sturdy ham and shoulder, and quiet disposition. Today that pigs descendants are called Durocs. At the 1893 Chicago Worlds Fair, Duroc pigs gained wide popularity at the first successful Duroc pig show. This was only the beginning of the Duroc pig popularity and success which continues today. They are now the second most common breed of pigs in the United States. They are also a major breed in many other countries, especially as a sire or in hybrids. 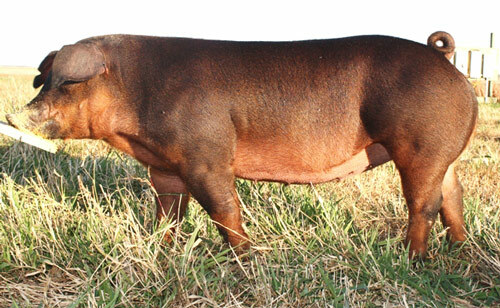 Durocs have floppy ears and can range from a very light golden to a very dark red that is like mahogany. The first organization for the purpose of recording, improving, and supporting Red Hogs was the American Duroc-Jersey Association, established in 1883. No other breed of hogs made more progress, in terms of numbers recorded, over a period of years. As a result, numerous other recording organizations were formed to accommodate the growth in popularity. In 1934, all the groups were united to form one organization, named the United Duroc Swine Registry, for the sole purpose of recording and promoting the Duroc pig breed. When the U.S. population moved westward, the Duroc pig and many noted breeders moved west as well. Most of the breed improvement after the formation took place in Ohio, Kentucky, Illinois, Indiana, Iowa and Nebraska. Duroc pigs have become a sire of choice to the American farmers. The climb of the breed has been accelerated by many distinguished accomplishments in prolificness and longevity in the female line, lean gain efficiency, carcass yield, and product quality as a terminal sire. The purebred Duroc pig is distinguished for breed potency in today's picture of pig’s improvement and holds forth inviting promise of future usefulness and value. Duroc pigs were identified as a superior genetic source for improving eating qualities of pork in the recent National Pork Producers Council Terminal Sire Line Evaluation. Their advantage in muscle quality combined with their well-established ability to grow fast has positioned the Duroc breed as an outstanding terminal sire choice.